At the end of SuperChickens?, I promised a link to a video from In A Nutshell. Here you go! No, the Z-Pack won’t treat the flu. So far, in our discussions on antibiotics, we’ve discussed what antibiotic resistance is and isn’t (Discussing the Disappearing Miracle) and how ordinary people accidentally contribute to this growing problem (Quitting When You Aren’t Really Ahead). While there is growing awareness that antibiotics in our protein supply (see SuperChickens?) can contribute as well, an area that becomes increasingly frustrating is over-prescription of antibiotics. This happens in two ways: patients, unaware of the difference between the causes of infections, may ask for antibiotics for illnesses even if they would be ineffective. Doctors, unwilling to see their patients suffer, offer something, anything, in an attempt to help. Unfortunately, neither scenario is truly harmless. In order to understand why prescribing antibiotics all the time isn’t harmless, we must first understand a little bit about pathology, or how disease impacts the body, a little bit about epidemiology, how disease spreads in a population, and a little bit about microbiology and immunology, how the body defends itself from disease (and the causes of disease). I will point out that it is possible to get doctoral degrees in each of these fields and to go into far more depth than I intend to explore here. My plan is to just skim the surface and help you piece everything together to make a complete picture. Raz and Aisha are a young couple working hard to make a home. When their new baby joins the family, they become familiar with all the sleeplessness that accompanies a new baby, the late night feedings, the endless diaper changes, and the wonder of rediscovering the world through the eyes of new life. It isn’t long before their new baby becomes an older sibling as the parents welcome their second child and everything is repeated. Raz and Aisha learn what every new parent learns at this point: Someone is always sick. This is normal in homes with small children, even healthy children. 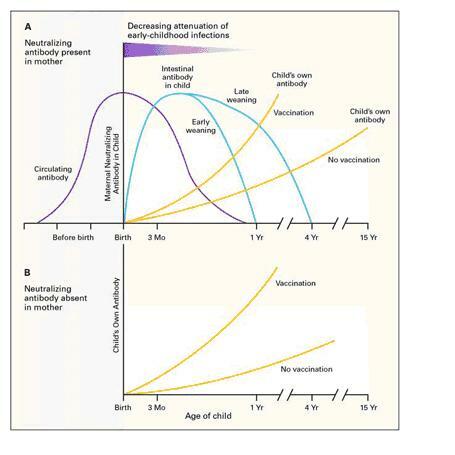 In the first five years of a child’s life, the immune system is learning and growing as much as the child is. During prenatal development (while the fetus was in the womb, connected to mother via the umbilical cord), the child had the benefit of mother’s antibodies, circulating immunoglobulin G (IgG). As soon as that cord is cut, however, so is the supply. Now it is baby’s turn to make antibodies. If mother can breastfeed (and not all mothers are able to, for a variety of reasons, but if they can, it is best), then baby gets another boost of antibodies from a secreted antibody known as IgA. This is excellent, because by about 4-6 months, mother’s supply of IgG is gone, but if baby is getting a constant supply if IgA, it can provide a boost of protection. Even at 12 months, baby’s first circulating antibodies are likely only around 80% of what they will ever reach at their best - little baby Sarah just doesn’t have the protection that her body needs to fight off everything that Raz and Aisha can. A year later, when baby Abram is born, Sarah will have grown, her body will have learned more, but there is still so much to learn - but Abram is starting from zero, just like Sarah did. So we have a young family, mother and father and two precious small children with growing immune systems. They get vaccines for themselves and their children. Dad’s vaccines ensure that his strong immune system is ready to defend his body and keep disease from gaining a foothold - he provides a fence around his family. Mom’s vaccine is another link in that fence - when parents go to work, they encounter microbes, bring them home, but inside of Mom & Dad’s body, the microbes encounter strong immune systems capable of eliminating the microbe before it can cause disease, and thus removing the threat to the children. But if Mom can breastfeed, Mom adds another layer of defense: the antibodies she makes are passed on to her children in her breast milk, and the children get that defense as well (see why this is so important to breastfeed if you can?) The children are getting a carefully timed sequence of vaccines as well. Each is a very specific dose, in a very specific sequence, aimed to teach their growing bodies how to protect them against illness. It’s also worth noting that vaccines are non-infectious, dead, weakened, or parts of viruses and bacteria. Vaccines can not cause the illness they protect against. Let me say that again. A vaccine cannot cause the illness it protects against. What vaccines accomplish is to allow the body to encounter pathogenic particles (bits of disease causing agents) in a controlled manner that stacks the deck in favor of the immune system. Instead of encountering wild viruses or bacteria that can and do cause disease in the human body with little to no preparation, vaccines train the body via the immune system so that when the body does encounter the wild pathogens (disease-causing agent), the body knows how to defend itself. OK, so Raz and Aisha have been doing everything they can, and they take Abram and Sarah out to play. Maybe they go to their local house of worship. Maybe both parents work, and the children are in daycare. However it happens, Abram and Sarah encounter the great big world, where there are other people. It isn’t too long before one of the children wakes up Mom with a snuffly nose, a cough, and a fever (of course they wake up Mom. Even if they woke Dad, even if Dad is a pediatrician, they still asked for Mom and wouldn’t calm until they got Mom. That’s just how we are. We want our Mommies. It’s ok. Or maybe you prefer they want Dad. The point is that parent is disturbed by sick child). Sick child cannot join other children. One of the parents must miss work, even if they decide that this isn’t worth a doctor visit yet. However Raz and Aisha decide, the decision is made, and the parents adapt to the needs of their child. Of course, the next day, the other child is ill, as well. Another day missed from work. Perhaps the parents opt to trade who misses. Maybe they’ve made other arrangements. But clearly whatever the children encountered in the wider world has defeated their own growing immune systems. Remember - these are small children, whose immune system hasn’t learned all the things that Mom and Dad have. It’s getting better all the time (as The Beatles said), but there just hasn’t been enough time yet. But there’s another race going on: as the children’s bodies race to grow and learn from the world around them, inside their bodies are all the Sue Streptococcus and Reeking Jim and other bacteria. And the kids have a cold, a virus we can’t vaccinate against because there are just too many varieties making too many changes. The most common cold virus, rhinovirus, is effectively a protein instruction manual inside a protein coat looking for a factory, and everyone is a factory. Worse, while there’s really one kind of Sal, even if he does mutate and change, there’s 99 kinds of rhinoviruses, and they don’t get along. Even if we figure out how to deal with one of the 99 rhinos, there’s 98 more waiting, and that’s just the most common kind. You probably have more than one virus at a time, too, so you’re not just dealing with Sal and his copies going crazy, or a single rhinovirus setting up shop in the factory that is your nose, but as many as 200 different viruses possibly causing your cold. So Abram and Sarah have a cold, which means they have multiple viruses that found their noses and mouths and decided to set up shop and start making copies. In response, their immune system has tried a few different things to protect them. To help kill the viruses, the immune system increases the temperature. Our body has a very specific temperature we like, but pathogens are even more picky. Often, a change in temperature can help kill the virus or bacteria causing illness. So up goes the body temperature, and up goes the misery. There’s viruses in the nose, so the immune system tries getting them out. Immune cells called neutrophils rush to the site, causing swelling and redness, which brings more heat and pain with it. This helps trigger mucus production and gives the kids runny noses. As the mucus runs down the back of the throat, it triggers a cough, too. In fact, if virus is in the airways, the immune response may continue there, causing sore throat and more cough. In fact, all the misery you feel from the cold is actually the result of your body fighting the cold. But if your body didn’t fight the cold, the virus would gradually take over enough of your cells to kill you. I think we can agree that given the choice between the misery of the cold and death by cold, death by cold virus is worse. From start to finish, it takes 7-10 days for the human body to fight off a viral infection. Some take longer - if there are more viruses, it may take longer, for instance, or if you don’t give your body the tools it needs, like rest and fluids, it may take longer. But there is really nothing that can be done to shorten the length of time you have a cold. Because viruses have to get into your cells to work, anything that would shorten the length of time you are sick must first attack your own body, and finding a way to kill a virus without killing the cell it infected is incredibly difficult. This, by the way, is why the side effects for anti-viral medications like tamiflu sound incredibly like more of the flu but worse. It actually is. This is also why some anti-virals have such a narrow window of effectiveness - once the virus is inside the cell, medication aimed at keeping the virus out of the cell is far less effective. Let’s get back to poor Abram and Sarah. Neither of them have the flu, right? They’ve got colds. And because colds are contagious, of course Raz and Aisha get colds and no matter how careful they are, Raz and Aisha share their colds, and everyone’s temper gets short because they’re discovering that when small children are present, someone is always sick. That’s how epidemiology works in families. Once the kids get older, that will happen less, but while they grow up, it will feel like someone is always sick, especially the more children there are and the more social the family is. This is actually good - their bodies are learning and growing and they will, in general, be stronger, healthier adults. As the family recovers, just as the last of them starts to feel better, things get worse. One of Raz’s coworkers decided to share his flu, and Raz shares with the family without realizing. The family goes to the doctor who mistakes flu for an ongoing sinus infection and prescribes Z-Packs for the lot of them. Here’s the thing. Streptococcal infections aren’t something to be ignored. If you have strep throat, take your antibiotics as prescribed, take every pill on time, finish the entire prescription, even when you feel better, and take them all. It’s very easy for your body to get confused and look at Sue and look at parts of you, like your heart, or your kidneys, and get mixed up. It’s called molecular mimicry, and when it happens, your immune system goes from being your best buddy to being a serious problem. It causes autoimmune problems like Scarlet Fever, where your body attacks itself instead of the bacteria. Before we had antibiotics, Streptococcal infections could be deadly even if you survived them. So we’re very eager to treat them, and it’s not a bad thing. But antibiotics can’t treat a viral infection. Remember the talk about resistance versus susceptibility? If a bacteria never had a weakness to a drug, it could never become resistant to it because it was never susceptible to it. Viruses are not susceptible to antibiotics. They will never be susceptible to them. Viruses are instruction manuals inside of a coat (sometimes wrapped in armor). They lack the mechanisms that antibiotics target. This, too, is a good thing; if viruses could live outside of a cell, if they could copy themselves without needing us, they would wipe us out in no time. We want viruses to lack those mechanisms, to effectively be in suspended animation when they’re not inside cells. So what happens when our little family makes the mistake of taking the Z-Pack for the flu? No harm, no foul, right? The have a viral infection that will wipe itself out in 7-10 days, so they’ll feel better if they take the pills or not (and we’ll pretend that they’re really good about taking them like they should). No big deal? Except there are friendly Sues that live with the Reeking Jims and another organism, a fungus we’ll call Difficult Claus. Good ol’ C. difficile. Just like the viruses aren’t susceptible to the azithromycin in the Z-Pack, neither are Jim or Claus. But unlike the viruses, Jim and Claus live in our bodies, serving an important function, growing with us. And they can live inside or outside. They don’t go into suspended animation like the viruses do. Normally, our Sues and Jims and Claus live with other organisms and with us in our intestines where they teach our immune system the difference between us and other, living off the food we eat and don’t need (all the food you eat has stuff you can’t use - that’s what they use). It’s a commensal relationship, not just between us and organisms, or microbiome, but within the microbiome itself. The Sues and Jims and Clauses all make sure everyone takes up just the right amount of space, that no one hogs all the best intestine. But when you take antibiotics, the Sues and the Jims start to lose, and Claus might grow out of control. In our happy little family, only Sue dies off. Jim and Claus stay behind, and now the children have unhappy tummies. Oh, and Sue keeps making copies of herself, remember? Just like Sal did. And the Sues that survive are the SuperSues. So when the children get Strep throat, and they need that Z-Pack to kill the bad Sues, the ones that are making them sick, guess what’s going to happen? If you guessed resistance, you guessed right. And what happens when we can’t fight strep infections? Molecular mimicry can happen. The risk of very bad things start to increase. So no. No Mom, No Dad, no, you may not have antibiotics for your cold, flu, or seasonal allergies. No, Doctor Meanswell, you may not prescribe antibiotics to help your patient feel better, even if you know it’s probably not bacterial. What you may do instead is insist on the test that will confirm that the infection is the bacteria or virus that will be treated by the drug you want, and then prescribe the most effective drug for that infection. Your future you will thank you. In another link from LinkedIn, we have a story about a study started 12 years ago, in Africa. In the US, iron supplementation is a common part of pregnant women's life; the benefits to the developing child can't be overestimated. In Africa, many children suffer from iron-deficient anemia. It seemed a natural solution to supplement the diet with iron supplements and other vitamins. However, during the study, more children on the supplement died than those not on the supplement, bringing the study to an abrupt and early end. I'll let you read the story for yourself; the reasons for the confusing results still aren't entirely understood, but are being sought out in order to hopefully correct both the nutrient deficient and the fatal result of correcting it in areas where malaria is endemic. I highlight it, however, not only because it's another LinkedIn story, but because it serves as an excellent reminder of the law of unintended consequences: solving one problem may cause another, or several others. While this is a large-scale example of unintended consequences, even in your lab work, you may encounter the same problems. Look for more detail on this idea in future posts. I mentioned in an earlier post that I'd been stockpiling articles and posts for daily uploads. This is the first of those, but before I get into that, I want to share where many of these are coming from, because that is, by itself, an incredibly useful professional tool. Recently (between starting the blog and restarting the blog), I joined/became more active on LinkedIn. I found groups there, including groups by interest. Among them are microbiology & immunology groups, and many of the links I will be sharing were discovered when they showed up in my inbox via a LinkedIn group! This may well be old news to many of you, but I didn't want anyone to overlook useful tools. Finally, remember: employers look at all online and social media when hiring, so be mindful of what you post (or what your friends may be able to post). Now, with no further ado: A video on how the flu invades the human body. Because light microscopy can't capture viruses, this is an animation, but it is very well done and has explanation with it. My husband shared this TEDMed talk with me tonight, and I wanted to share it with you, along with Dr. Attia's blog. It takes courage for doctors to deviate from traditional wisdom or the accepted dogma and consider new approaches to existing problems. However, I've found that, in my own personal experience, the evidence he seems to be describing is accurate: I've found that eating more whole grains and fewer refined carbohydrates is far better for me and my diet than any low-fat approach ever attempted (low-fat seems to always actually result in higher cholesterol for me, meaning that my body compensates for the lower dietary intake by raising the production, indicating an internal imbalance that diet alone can't correct). I'll be following Dr. Attia, and I hope to have more information for you in the months and years to come. The NIH recently announced a pilot program to help speed up drug development. Most drug development focuses on finding new molecules or compounds to treat existing disorders. The new program is looking for researchers to find uses for existing compounds, hopefully reducing both the cost and time involved in developing new drugs. Because I’m a universal donor, when the waiting period between donations is up (it takes 56 days for red blood cells to replenish themselves), I often get a phone call or email encouraging me to come in. I rarely need it - I make sure, when I leave, that I note when I’ll be eligible again, set a reminder in my calendar, and then work it into my schedule. But I still get the reminders - less than half of the population can safely donate, and not enough of us do. That lack of volunteer donors creates a problem: the demand for blood often exceeds the supply. Science has been seeking an answer to this problem for decades, including producing synthetic blood products. However, nothing has replaced human blood... until now. Actually, that’s not even really fair to say. Scientists in Scotland have gotten permission to pursue human trials of a synthetic blood product, but this product still has a human source. Grown from human stem cells, it takes a source of immature, not-yet-differentiated blood cells, clones them, and then mass produces blood from this stem cell line. Nor are these the controversial embryonic stem cells - these come from adult donors. So this synthetic blood has an entirely human source, but is then mass produced outside of a human body. Before it can be widely accepted in hospitals around the world, it must go through rigorous testing, and this is the step being carried out now in Scotland. The first human trials have been approved. This means that healthy men and women will be given the new blood product and monitored. As long as there are no adverse reactions, testing will continue. I’m certain there will always be a need for donors like me. But the fact that we may have a viable alternative means that maybe, someday, people need never die from a lack of safe blood again. This time from The Scientist. Seriously, this is only good news. Thanks to Paula A. for the link to this article! (I may interview her for a future article - she is part of my inspiration to become an immunologist, because she's the first one I've ever known!). In a demonstration of just how deeply entrenched science and medicine are in our everyday lives, an article in the Wall Street Journal today announced an important decision from the US Supreme Court: Human Genes cannot be patented. This has been hotly contested: those arguing for patent have argued that the research and development done with the genes is costly, and without the protection of patents, it is likely to go unfunded. Those arguing against patent have pointed out the flaw of patenting a gene carried by millions of people (or even just a few), and worse, the trouble that is caused when a carrier of a gene seeks treatment for their condition, only to find out their own genetic code is locked under patent protection. I, personally, am an advocate of openness and freedom. I believe that keeping medical research like this locked under patent is absurd, and often hinders advancements in treatment. I will note, however, that I am not currently employed by any researchers, and thus I am not bound by any such privacy agreements myself. I can understand if a scientist's work and livelihood is dependent on funding and thus on signing privacy agreements. I may find them absurd, but at the end of the day, pragmatism still has its place. Still, I think this was a victory for the open exchange of ideas. What do you think? Will this be a boon to medicine? Should it have ever been in question? Gladstone scientists map process by which brain cells form long-term memories. Great discoveries are not made all at once, but rather in little steps, one at a time. One such little step seems to have uncovered the pathway by which learning goes from temporary into long-term storage, thus establishing new pathways in the brain long into adulthood.